Home » Around the farm » Its a dogs life ……and maybe a cats too. 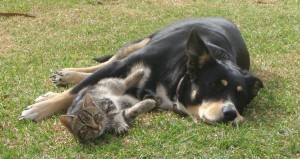 Its a dogs life ……and maybe a cats too. I was thinking that I needed to introduce you to some of the other members of the team here at Three Farmers ……the four legged ones. 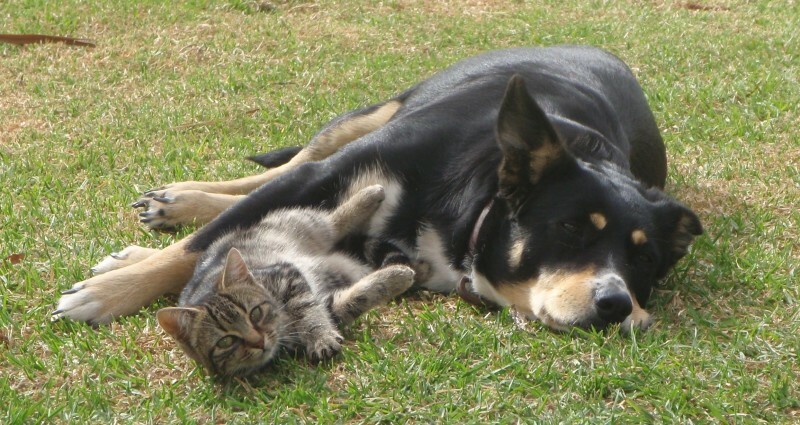 Meet Fly, 9 year old black and tan kelpie and Taco, Chief-in-Charge of mice. Fly is my dog. Born here on the farm (her mum is Poss, one of our other kelpies), the intention was for her to be a worker until a hip injury as a puppy interrupted the program. She spends most of her time loitering around the place, cautiously checking out visitors to the house and sleeping. Consequently she is often referred to as the laziest dog in Fosterville. She does come out to the paddock with us, and like most kelpies do, only takes orders from one person, me. The trouble is she isn’t very good at executing said orders (or maybe I am not very good at giving them!) and has been known to split the mob, get in the way of the other dogs or just plain run back to home. This has resulted in some loud paddock language from Tim and a preference for Fly to stay on the ute! Sometimes I think she is just as happy with that arrangement. Taco arrived on the wind about 5 years ago and was discovered as a small bundle of wild fluff under the house with no sign of a mother or a father. Why the name? At the same time she arrived at our place, the swine flu arrived in Australia from Mexico. What else comes from Mexico? Tacos! Anyway, with some time and persistence on our behalf we made friends and after a trip to the vet to ensure we didn’t have a lifetime supply of kittens under the house she took up residence as our farm cat. Tim was not entirely sure about this arrangement – memories of his mothers Persian cats stalking the back verandah and howling when he was a child hadn’t left him a great friend of cats. I think Taco knows this as I am the only one she allows to pick her up for a quick cuddle. She absolutely loves Fly, in a Milo & Otis kind of way. I often see them heading off together across the paddock on some sort of adventure, winter nights are spent snuggled together on the hammock on the back verandah and they are both known to accompany Emme and I down to the letterbox to collect the mail. Taco’s tenure here is secure, I haven’t had a mouse in the house since she arrived!